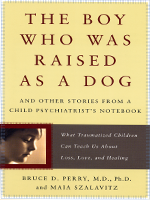 Bruce Perry's The Boy Who Was Raised as a Dog: And Other Stories from a Child Psychiatrist's Notebook is a book about brain development in traumatized children. In it, Perry walks us through some of his most challenging cases, and explains what he learned from each child. Captivated by the children's experiences, I couldn't put the book down. Perry took it a step further, however, by explaining the intricacies of the brain in a way that's accessible to the everyday reader, proving how trauma at a young age can affect brain development, and discussing what therapy worked for the children to allow them closure so that they could move forward. A fascinating read.